Well we have compiled a list of things to do to keep your kids busy and out of your hair! The decorations have to come down so you might as well get the kids to help you. Involve all the kids the younger ones and older ones. Give them appropriate tasks – smaller children can take down the ornaments at the lower part of the tree, the older ones on the top, pick up and carry boxes. Better yet make a competition of it! See who can take down the most ornaments in 3 minutes or who can pack everything away the fastest. Not only does it make it fun for them you get your un-decorating tasks done faster! As most can attest your children simply have too many toys. Perfect time to get the kids to look through their toys and see if there is anything broken or have missing pieces that can be tossed out. They can go through toys that they are no longer playing with and teach them to be charitable at the same time. They can donate to less fortunate children, a childcare center or shelter. It helps them keep busy while cleaning and helping others. You can’t get better than that! They can write their notes all at once or over the course of several days. What would be even better if they take a picture of their gift and send the note via snail mail or electronically. You can even top that suggestion with a video of them saying thank you featured with their gift, which will create even more excitement for the kids and bring a smile to the gift giver. Bottled up in the house will make them go crazy. Yes it’s cold in some parts of the United States or snowy but let them go outside. Kids are okay as long as they are bundled up and if it’s snowing, even better. The endless possibilities of games and things to do in the snow is unbelievable. If it’s warmer where you are located hiking, biking or even visiting the park can give them and yourself a break too. Take time and read with your kids. If they are older set apart some time in the day where everyone drops everything and read. If they got new books for the holidays they can start reading those or visit the local library and pick up some books. Kids usually don’t want anything associated with school and reading is one of them but make it fun and interactive. Act out character voices, dress the part, or make a play from the story. The goal is to get them excited about reading. How can I get them excited about reading you say? We can help in this area. We have personalized kids books where children become the star of their very own story which will get them excited about reading. Our kids books far outweigh traditional books because children read about themselves and not about others in the stories. 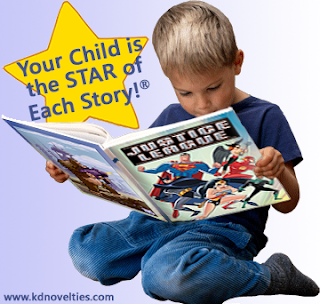 Our books range from birth to about 12 years of age and we have books for both boys and girls. Check out our large library at www.KDNovelties.com. Get Your Tweens to READ!